In our sitting-centered culture, the hips are highly susceptible to both underuse (weakness) and inflexibility (tightness)—a very unfortunate coupling that can lead to a plethora of afflictions. Because of this, the hips can be a nuisance for a lot of us. The hips are composed of many different muscles that attach across the pelvic girdle—mainly the hip flexors (the iliopsoas group), the inner hips (the adductor group), and the outer hips (the gluteal group and the external rotators of the hip)—so people can often experience pain or discomfort in one specific muscle or in many muscles simultaneously. Beyond that, the connective tissue of these different muscle groups can also become irritated, stressed, or inflamed to create further or entirely different discomfort. Conditions such as sciatica (symptomatic pain, tingling, numbness, or weakness in the lower back, buttocks, or legs from any irritation or inflammation of the sciatic nerve); piriformis syndrome (a condition in which one or both of the piriformis muscles compress and irritate the sciatic nerve); muscle, tendon, or fascia stress and/or strain; or more can be related to excessively tight or weak hip muscles. Gentle strengthening and stretching exercises can make a world of difference to those experiencing pain or discomfort around the hips. And luckily for some people, yoga may help to alleviate some of the symptoms (and causes) associated with this discomfort. Yin yoga can be an excellent tool for relieving tight hips and for releasing problematic tension that may potentially impinge the sciatic nerve. The yin practice that follows is focused on lengthening, rather than engaging, the musculature and connective tissues surrounding the hips. However, please note that if this practice causes irritation, it is wise to check with your doctor or physical therapist, as you may need to strengthen your hip girdle before stretching it. Although stretching and releasing the muscles and connective tissue of the hips can often be crucial for alleviating discomfort, overstretching any part of the body may cause it to overreact—potentially even contracting and creating more discomfort. So always move slowly, stay connected to your breath, and listen to your body in each posture. Please also note that every body is different and all exercise and stretching routines should be individualized to your own body. If you have an injury or condition that you’re unsure about, check with your healthcare provider before practicing this sequence and always allow your own body to be your primary teacher. While props are not essential for this practice, you may wish to have a blanket, block, strap, and/or bolster for comfort and support. Begin seated in any comfortable position: It may mean sukhasana (easy pose) or virasana (hero pose); it may mean sitting on top of a block or folded blanket(s) or in a chair. Choose a position in which you can completely relax and release muscular tension. Close your eyes and draw your attention inward. Listen to the natural cadence of your breath. Evaluate its rhythm and strive to deepen each inhalation and exhalation. Find a consistent beat that can serve as the metronome of your practice. Sitting silently, allow yourself to become present and aware in the moment. From seated, remove any props that you may be sitting on and come onto hands and knees. Align your shoulders over your wrists and your hips over your knees. Step your right foot between your hands beside your right thumb and come onto your fingertips. Stack your right knee directly over your right ankle. Lengthen your spine, reaching the crown of your head and your tailbone in opposite directions. Keep your left knee on the floor. You may wish to place a blanket under it for added comfort or scoot your left leg back slightly so that your weight does not rest directly on your kneecap. You may also wish to place blocks under your hands to facilitate length through your spine. Move your right hand to the inside of your right foot and place it on the floor or a block and inch your right foot toward the right side of your mat. You can stay here or lower both forearms to blocks, a bolster, or the floor while maintaining length in your spine. You can align your elbows either directly under your shoulders or slightly in front of them. Whichever option you choose, come onto the outer edge of your right foot, and reach your knee toward the right, externally rotating your femur. You may wish to angle the toes of your right foot toward the top right corner of your mat to do this. If it feels appropriate, place your right hand on your right thigh and apply gentle pressure to increase the external rotation as you also twist your torso to the right. Hold your chosen variation for five minutes, maintaining the same steady breath that you created in the beginning of your practice. Then gently release and return to hands and knees. Move through a slow and controlled round of cat-cow stretches before (and after) switching sides. From all fours, sit back on your heels, then shift your weight to one side so you can sit with your legs stretched out in front of you. You may wish to prop yourself up on a block, blanket, or bolster to feel more comfortable. Bend your right knee and place your foot on the floor about a fist’s distance from your right sitting bone and a fist’s distance from your left leg. Lift your left hip and slide your whole left leg slightly forward to prepare to twist. This will allow your sacrum to twist with your pelvis, removing unnecessary pressure on your sacroiliac joints. Release your right hand behind your right hip and either keep your palm flat against the floor or tent your fingertips. Elongate your spine on an inhale. Rotate your whole torso to the right as you exhale. Wrap your left arm around your right leg. You can stay as you are or cross your right foot to the floor outside your left leg. If you take this variation, you may also wish to bend your left knee and draw your left foot toward your outer right hip. Hold your chosen variation for three minutes before switching sides. Maintain length in your spine throughout. Return to a comfortable seated position with your legs stretched out in front of you. Again, you may wish to prop yourself up. Elongate your spine. Cross your left leg over your right. If you feel a stretch in your outer left hip, you can stay here or bend your left knee and draw your left heel toward your outer right hip, stacking your knees as much as possible. You may choose to remain in this position or bend your right knee as well and draw your right heel toward your outer left hip, striving to keep your knees stacked. If there’s a large gap between your knees, you can either elevate your seat (with blocks, blankets, or a bolster) and/or place a prop between your knees. Wherever you decide to be, make sure your breath remains full and steady. Become passive in your stretch, allowing your muscles and connective tissue to surrender to the yin (the soft, lunar) energy of your body and your practice. You may stay as you are, or if it feels appropriate, you can lead with your heart (maintaining an elongated spine) as you fold forward over your legs. Use props as you wish to support your body at any stage of the fold. Hold for five minutes before switching sides. Return to sitting with your legs extended out in front of you. Bend your knees, cross your ankles, and roll forward onto all fours. Align your shoulders over your wrists and your hips over your knees. Bring your right knee to touch the outer edge of your right wrist and then release your knee to the floor as close to your right wrist as is comfortable. Slide your right ankle as close to your left wrist as is comfortable. If your shin is parallel to the top of your mat, dorsiflex your ankle by drawing your toes back in the direction of the right side of your mat. If your foot is closer to your groin, press the outer edge of your foot into the floor to avoid sickling your ankle. Walk your left knee back and slowly release the front of your left thigh toward the floor. You may wish to place a block, blanket, or bolster under your right buttock—and I would highly suggest doing so if it does not touch the floor. If you use props for support, arrange them so your pelvis will be level. The goal is to relax completely here, so support yourself in whatever way is needed. Point your left foot so that the top of your foot is resting on the floor. Rise onto your fingertips and elongate your spine. Aim to square your hips toward the top of your mat by drawing your right hip back and rolling your left hip forward. You can stay as you are or slowly begin to lower your torso toward the floor. Stop wherever it feels appropriate, and use props for support if you’d like (e.g., place a bolster under your chest or a block under your forehead). Try to soften and surrender into the space you’re creating with this posture. If you have sciatica or sensitive or injured knees, it may be more comfortable to take the reclined variation of sleeping swan: eye of the needle pose. Instead of coming onto all fours, lie down on your back, bend your knees, and place your feet on the floor hip distance apart. Lift your right foot, flex the ankle, and cross it over your left knee to create a figure-4 shape. Lift your left foot and draw your left knee toward your chest by placing a strap or your interlaced fingers behind your left thigh; maintaining this shape and an elongated spine, cautiously draw both legs toward your chest as you simultaneously press your right knee away from your body. Whichever variation you choose, hold for five minutes before switching sides. From eye of the needle, roll to one side and come to sit with your legs extended out in front of you. From sleeping swan, slowly lift your torso, remove any props, and lean to your left, swinging your right leg around in front of you and then extending your left leg to meet your right. Bend both knees and find a comfortable cross-legged position with your right shin in front of your left, using props if you wish. Elongate your spine and let your sitting bones sink into the earth. You may wish to stay as you are, or lifting your right leg and firmly flexing both ankles, you can slide your left shin forward so that it’s parallel to the top of your mat and stack your right shin on top of it: Your right knee should be directly over your left ankle and your right ankle directly over your left knee with your right foot just beyond your left knee. Again, you may wish to elevate your seat with props or place a prop between your right knee and left ankle. Wherever you choose to be, find length in your spine. You can stay as you are, or if it feels appropriate, you can fold forward over your legs. Stop at any point that feels like enough and perhaps use props for support (e.g., use a block or bolster to support your forehead). Hold for five minutes, maintaining a deep breath, and then switch sides. 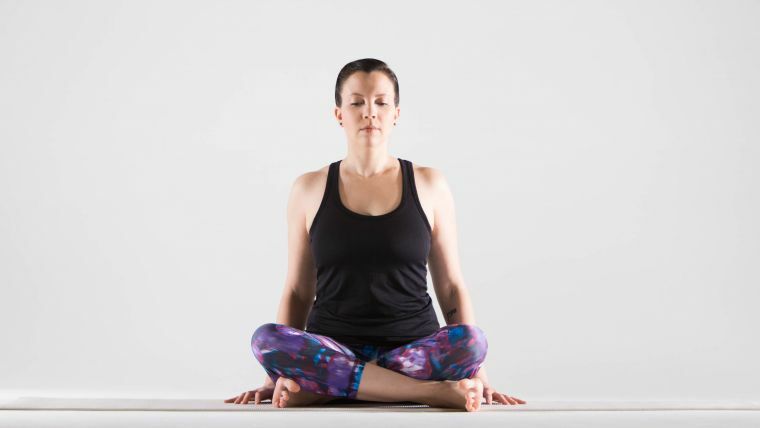 From square pose, extend your legs, then bend your knees and place the soles of your feet on the mat about one foot in front of your sitting bones. Walk them mat width apart and then release both knees to the right (your right foot should touch your left thigh). This places your right leg into external femoral rotation and your left leg into internal femoral rotation, offering a partial counterpose to the previous externally rotated stretches. Place your left hand on your right knee and either place your right palm or tented fingertips behind your right hip. As you inhale, lengthen your spine, reaching your tailbone and the crown of your head in opposite directions. As you exhale, rotate your torso to the right. You can stay as you are or continue to rotate farther by walking both hands to the right in a clockwise direction (to deepen the twist). You may even want to release your forearms or your torso onto props or the floor. Hold for three minutes before switching sides. Lie down on your back. Extend your legs and relax your arms by your sides, pausing for a moment in the release. Bend your left leg and place your foot on the floor. Lift your right leg and either loop a strap around the ball of your foot or hold your right big toe with a yogi toe lock (wrapping your first two fingers and thumb around the toe). Release your left arm out into a half T. You can keep your left knee bent or straighten your leg. Gently draw your right leg toward your chest and then take it across your body to the left. Switch your grip on the strap or your toe so that you are now holding with your left hand. Release your right arm out into a half T. You may wish to place your right leg on a bolster or your right foot on a block, or you can let your right foot rest on the floor. Try to allow both shoulders to soften toward the mat. If you would like to move into cat pulling its tail, bend your left knee and draw your left heel toward your seat, catching hold of your foot with your right hand to stretch your quadriceps and hip flexors. Surrender into the stretch for five minutes, then switch sides. Return to a neutral position on your back. Pause for a brief savasana. Bend both knees and place your feet on the floor hip distance apart. Cross your right leg over your left (as if you’re sitting cross-legged in a chair). You can stay as you are or double wrap your legs, taking your right foot around your left calf, coming into an eagle bind. Lift your hips and scoot them to the right. Then, maintaining the same shape in your legs, release both knees to the left. You can rest your right knee on props or on the floor, but make sure that the weight of your legs is supported by something. 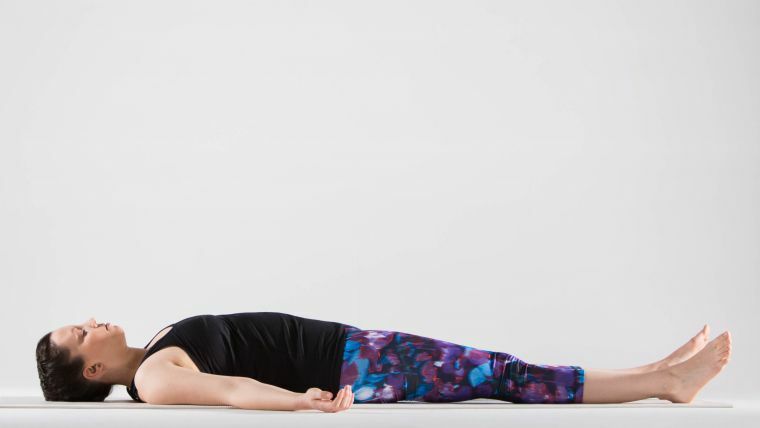 Allow your right shoulder to soften toward the mat as you sink into this supine twist. Hold for five minutes, then switch sides. Release into savasana. Allow yourself to melt into the floor. Let go of muscular control and control over your thoughts. Simply surrender to what is and into this state of stillness. 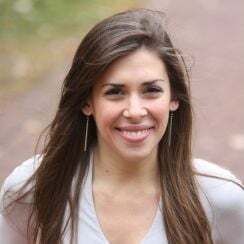 Hip tightness, weakness, or dysfunction can be painful and frustrating, but sometimes, it can be surprisingly easy to find relief. Practicing simple stretches and sequences of stretches can help to alleviate the symptoms and may even help to resolve the pain completely! Even if you don’t have 90 minutes for a full yin practice, you may find that five to ten minutes a day doing any of the above poses can make a world of difference.